Some kids returned to school in August. Have yours? Maybe your children are getting ready to begin the new school year after Labor Day. In other words there’s still time to read about and buy the latest books covering the entire school experience. Today’s titles range from first days and school staff to pet pandemonium. 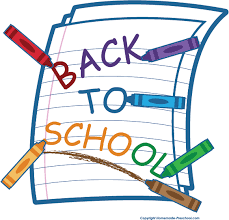 Don’t forget to also check out our Back-to-School Roundup Part 1. What do you do when you love pets so much that you can’t imagine going to school without one? That’s Bartholomew Bott’s dilemma in No Frogs in School. Monday meant frogs much to his teacher’s dismay. Tuesday turned out to be super for bringing in his salamander. Once again, Mr. Patanoose, was not amused and banned all amphibians from being brought to school. It worked out to bring Horace the hamster to school on Wednesday, but once on campus things didn’t go so well. Mr. P added rodents to the banned list. On Thursday Sylvia the snake had a turn and scared some classmates. Naturally no reptiles were allowed after that fiasco! In fact for Friday’s show and tell, the teacher specified that kids could bring in anything “But no more of YOUR pets.” That’s when Bartholomew had a brilliant idea. He’d bring in Rivka the rabbit who could be EVERYONE’S pet! And that made all the kids and even Mr. P happy. 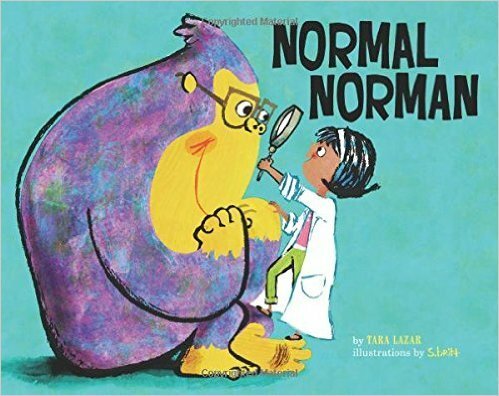 Kids can be so literal and LaFaye has taken this childlike characteristic and woven it into a cute and colorful tale. I give Bartholomew a lot of credit for persevering to get his beloved creatures to accompany him to school. When that didn’t work, he found an even better solution, a class pet to please all. 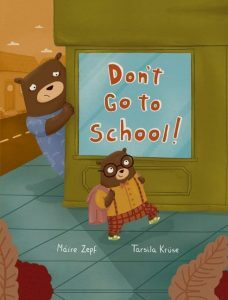 LaFaye’s created a clever story about a clever youngster that will appeal to pet-loving kids everywhere. 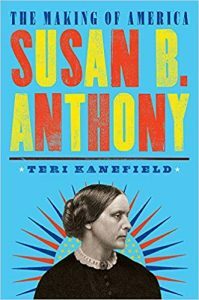 This year ’round read is infused with subtle humor that is complemented beautifully by the illustrations. From the kitty in the fish bowl to a sandwich eating duck, the first spread by Ceulemans gives readers a great idea what fun the multiple media artwork has in store. I laughed upon finding a sock puppet peeking through the classroom door in the second spread that I’d somehow missed during my initial reading. I appreciated all the attention to little details whether that is a student about to eat a shovelful of dirt or Bott’s slippers. Pick up a copy today and enjoy! In Fairy’s First Day of School, the action starts off before the title page with a speech bubble “Wake up,” as a lady bug calls out to a sleeping fairy. Over breakfast Mama fairy explains how things will go on the first day of school which in this case means the entire routine we all know so well—swan school bus, teacher greeting, classmates meeting, circle time, show and tell, centers, recess, lunch, nap time, story time, and home—but with wings and fairy things! This delightful twist on what children should expect on their first day works so well with the fairy angle. All the tiny things are gem-toned and appealingly illustrated. And all the activities are ideal for winged little ones such as art center, tooth center and spells center. Just remember your wand for cleaning up any messes made. It’s so much fun playing hide-and-seek behind toadstools, dining on “a petal-and-dewdrop sandwich” and eating one human-sized sprinkle for dessert. 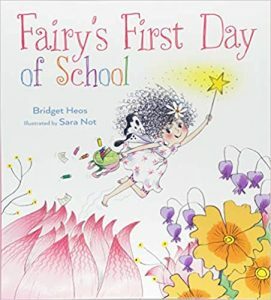 Just imagine having story time in a bird’s nest and you’ll understand how charming and enchanting this fairy-take on the first day of school is. Not’s whimsical illustrations combined with Heos’ magical language and fun premise make one reading simply not enough. While I was never a P.E. enthusiast as a student, I have to admit Charles Ghigna’s “Coach” felt upbeat and its ending, “life is a gym / come- / have a ball”, is terrific. So is the accompanying artwork by Ellen Shi. In it she’s presented the instructor with students from what would likely be the ball’s perspective, down low and looking up, with students’ faces fixed on the coach, replete with whistle in her mouth, hands gesturing, all under an afternoon sky. Hopkins shares the magic a librarian brings to their position, the one person I credit with turning me into a reader when I had all but given up on books as a second grader. Notable poet names you’ll recognize, as Hopkins often includes many of them in other collections, are Ann Whitford Paul, Alma Flor Ada, J. Patrick Lewis, Joan Bransfield Graham, Amy Ludwig VanDerwater, Renée LaTulippe plus others new to me such as Robyn Hood Black, Michele Krueger, Matt Forrest Esenwine, Darren Sardelli, and Irene Latham. Shi’s illustrations, done digitally, are cheerful, energetic and cover a range of emotions from the sadness of an ill child at the nurse to dramatic student performers in theater class. 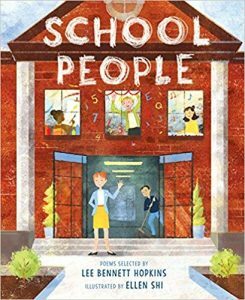 School People, an ideal read aloud, is a fitting tribute to the variety of important individuals whose roles throughout a typical school day help shape our children’s learning experience. Albie Newton by Josh Funk – Wunderkind or What? 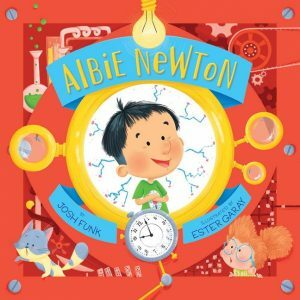 Happy Book Birthday to author Josh Funk and illustrator Ester Garay on the publication of their terrific new picture book, Albie Newton, today! I know I’m not alone when I say how excited I get when a Josh Funk book arrives on my doorstep. I carefully unwrap the package, cradle the book in my hands, study the cover close up (this one’s a dazzling red I first saw when the cover was revealed on social media), smell the new book smell, feel the smoothness of the pages and then savor the surprise of his story. And, like previous Funk picture books, this one does not disappoint. 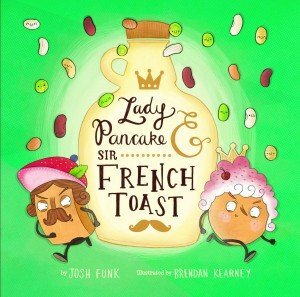 It’s witty like so many of Funk’s books and is written with well-metered rhyme and no superfluous words or sentences to tell the tale of the titular main character. To put it another way, it simply works wonderfully like one of Albie Newton’s well constructed inventions! Albie Newton is smart, but when his passion for inventing collides with his desire to make friends, it causes a bit of a brouhaha in his new preschool. Watch out what you’re doing fellow preschoolers because the new kid in class, Albie Newton, just may have his eye on what you’re playing with. The thing is that while Albie thinks his plan to “construct a special gift before the school day ends,” will win him friends, it ends up doing the opposite. 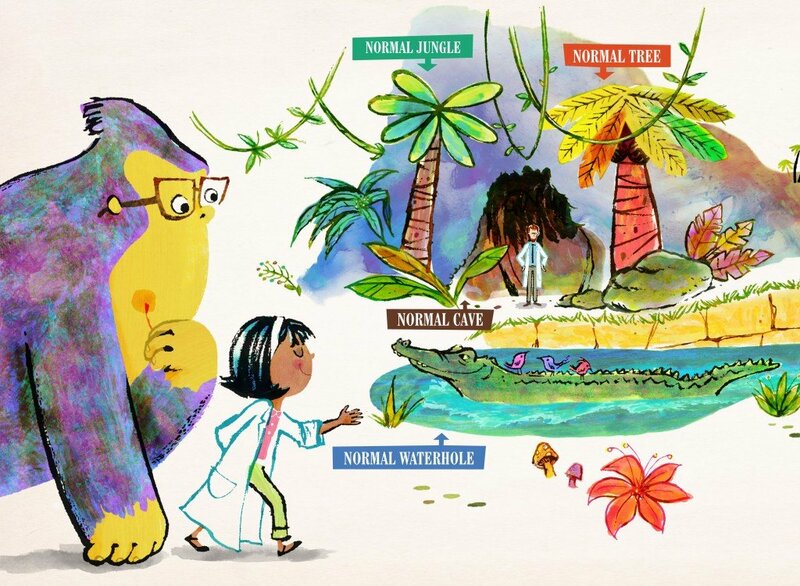 Interior artwork from Albie Newton written by Josh Funk and illustrated by Ester Garay, Sterling Children’s Books ©2018. How’s a child prodigy to know? Taking things from others, whether it’s for your top secret invention or not, is not looked upon kindly by other kids. If you seem to show off too much or swipe things without asking, that’s bad manners. People may actually misconstrue such behavior and label it self-centered, single-minded and rude. Fortunately classmate Shirley is clued in. Certain kids excel in some ways and not in others. Shirley realizes Albie is oblivious to the havoc he is unintentionally wreaking and wonders if maybe his cool creation can take everyone’s mind off the mess he’s made trying to forge new friendships. Will they let Albie off the hook? As it turns out, Shirley’s one darn clever preschooler, only in a different way than Albie. 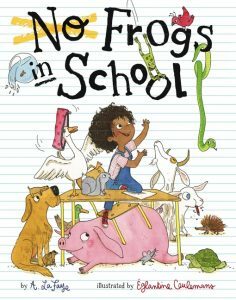 With Albie Newton, Funk has honed in on the meaningful topic of a child’s desire to make friends while not necessarily knowing how to do it. Just because Albie doesn’t know the right way to go about befriending others doesn’t mean he can’t learn how nor does it mean that having friends doesn’t matter to him. Garay’s upbeat and eye-catching illustrations will charm and entertain Albie Newton readers. I would recommend looking at the artwork more than once to catch all the clever things she’s included. 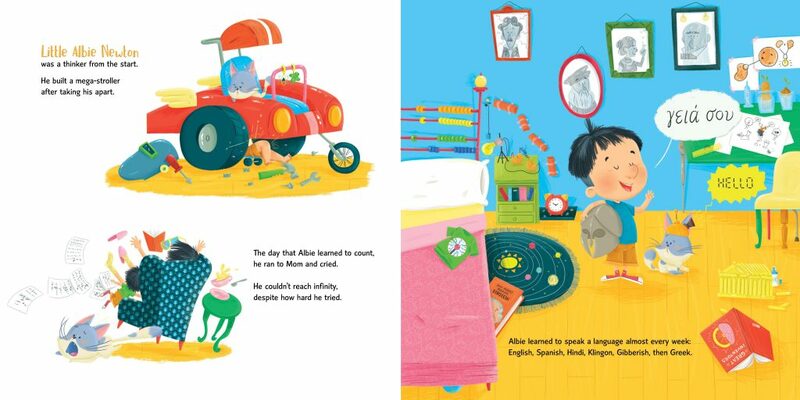 From the cute kitty, the fabulous facial expressions and the colorful kids’ clothing to the pictures hanging on the wall, random book titles and ultimately Albie’s invention itself, there is so much to enjoy. 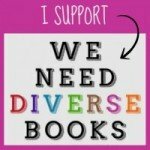 The diverse classroom population and student names also provide a positive representation for youngsters to see and hear when they read the picture book or are being read to. Albie’s social skills may not be as fine tuned as his inventions, but that doesn’t mean his heart’s not in the right place. 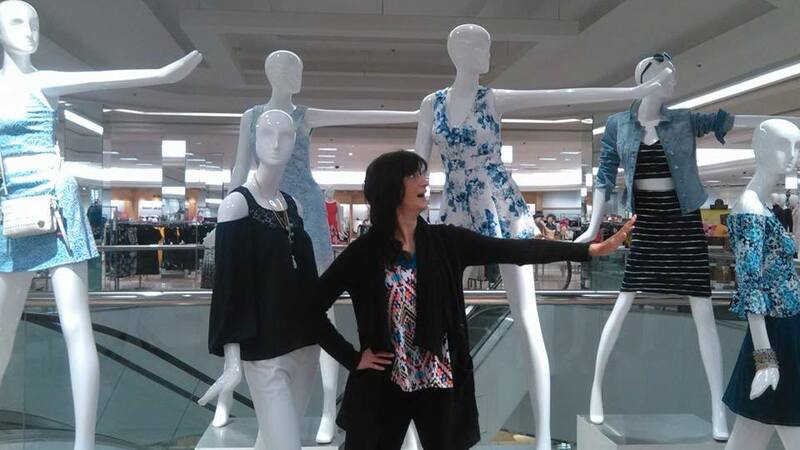 It often takes a caring person like classmate Shirley in this case, to gently lead the way. 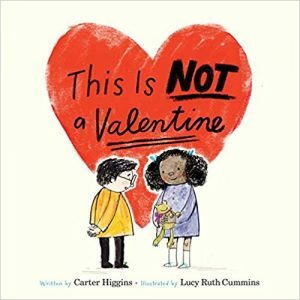 Check out the variety of Valentine’s Day books that are available this year to share with your kids. 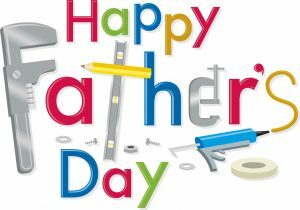 Whether you’re seeking something traditional or offbeat, sentimental or silly, we’ve got you covered! 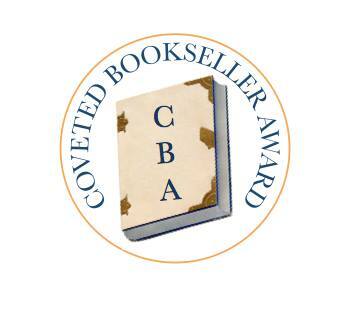 Make tracks to your nearest independent bookseller and pick up several copies using our list below. Nothing goes better with a bouquet than a book! This may NOT be your mother’s Valentine’s Day book but it is your children’s! 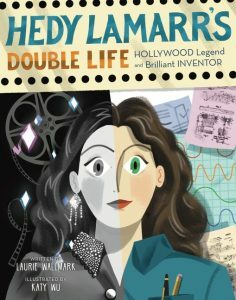 Higgins has taken the typical holiday book and turned it on its head as only an author who is also a school librarian can. 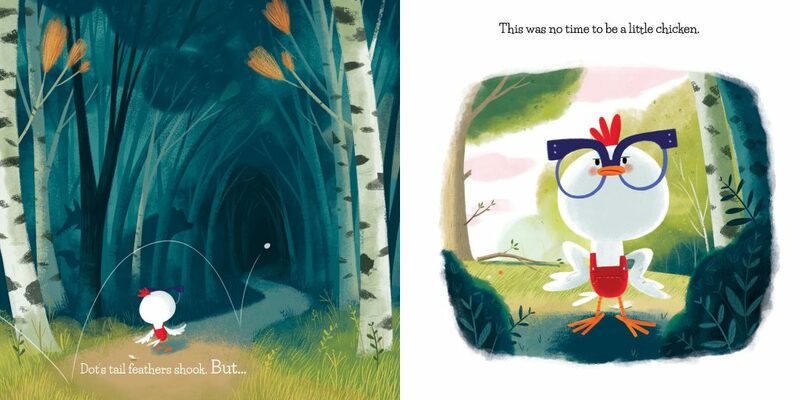 Prepare for quirky yet charming in this nothing hearts or pink or gushy debut picture book. 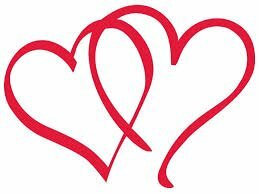 This is NOT a Valentine celebrates friendship and the kind of love worth getting excited over when you find a friend which whom you have so much in common or adore simply because of who they are and how they make you feel. With kid-centric, feel good artwork that starts with the title page and takes readers through a school day, Cummins’ illustrations demonstrate how the two friends enjoy each other’s company. And while this book may not be a Valentine, it sure feels like one. And that’s okay, even without glitter, cursive writing or dainty lace. Love comes in many shapes and sizes, and is anywhere and everywhere. De la Peña’s Love lyrically and gently conveys the many ways that love manifests itself. Long’s soothing and superb illustrations add to the reassuring nature of this story. Sure to provide comfort to children experiencing growing pains, doubts and fears, this much lauded story also honors the buoyant bonds of family and friends with loud and quiet moments of steadfast love and devotion. Love can be “the smell of crashing waves, and a train whistling blindly in the distance …” or it can be found “in the arms of a loved one who bends to your ear and whispers, ‘It’s okay, it’s okay, it’s love. 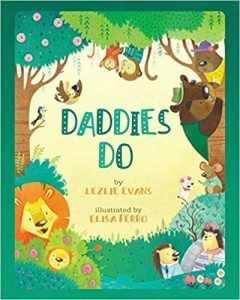 '” It’s tenderness, touching and togetherness rolled into one powerful picture book. Love is filled with ample white space to contemplate the radiant artwork while soaking up the the words slowly and then beginning all over again. Stunning spreads show upbeat slices of life such as a dad and daughter dancing on a trailer home rooftop and youngsters playing with a policeman in the mist of “summer sprinklers.” There are also moments of discord such as a couple fighting and disaster shown on a TV broadcast. 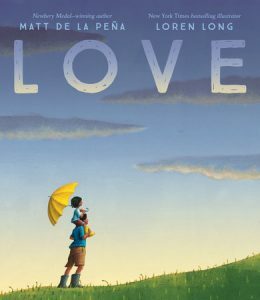 “One day you find your family nervously huddled around the TV, but when you ask what happened, they answer with silence and shift between you and the screen.” Reading Love is a visceral experience that will move adults reading the story aloud to squeeze their children a little tighter and plant extra kisses on their cheeks. Four letters say so much. In van Hest’s I Give You My Heart, young Yuto’s instincts take him to an old shop where the elderly owner gives him a box, a gift that will positively influence him throughout his life. At first the special box won’t open, but when it does, a seed grows from inside which one day Yuto must plant. 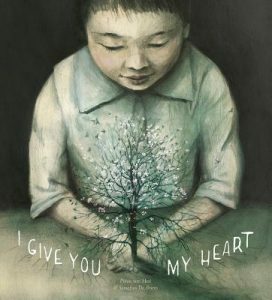 Eventually, as the tree grows, so does Yuto who finds the tree plays an important role in his life—a solid, steady force offering him comfort and stability that he wants to share with his wife, children, and when the time comes, another young child just like Yuto was when he was gifted the box. 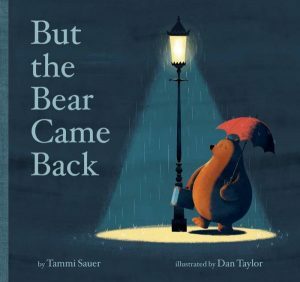 This beautiful, poetic picture book demonstrates another aspect of love as depicted in the circle of life and nature. Don’t miss this stunning 56 page gift book full of wonderfully impressive laser cutouts in addition to all the other moving illustrations. Those of us of a certain age will remember way back in 1965 when the song, What the World Needs Now is Love reached Billboard’s Top 10 and was playing on radios everywhere. The controversial Vietnam War was raging, protestors were picketing and Civil Rights activists marched from Selma to Montgomery. And the more things change the more they stay the same. 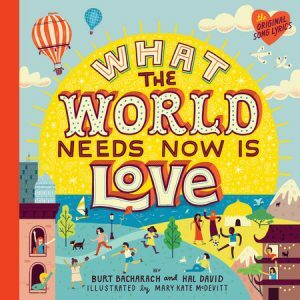 In a brief intro to this song turned inclusive and encouraging picture book, composer Bacharach says, “When Hal David and I wrote this song in 1965, it was an observation on what was going on in the world, and we thought it was an important statement to make. Now, decades later, the song’s meaning has become much more powerful. We’re so glad we wrote this song, and are delighted that you can now enjoy it as a book.” Originally recorded by Jackie DeShannon, this song made an indelible impression in my brain because it’s so upbeat and yet so simple. 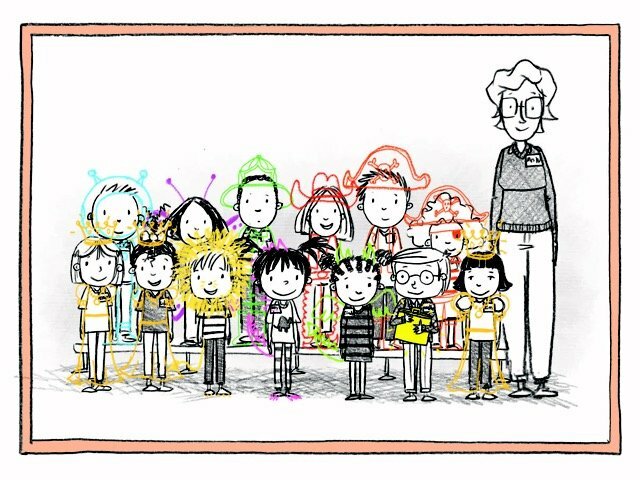 It’s pulled together by McDevitt’s hand-lettered song lyrics and vibrantly illustrated diverse images of children from all walks of life, playing or simply hanging out together. Show you care this Valentine’s Day by giving loved ones a copy of this small (6 1/2″ x 6 1/2″) 32-page book that’s as colorful as it is charming and packaged with a red ribbon enclosure. The one place that love should start, emphasizes Parr’s rhyming text in Love The World, is within ourselves. This meaningful message from Parr seems to jump out from every vibrant and boldly illustrated page that also shout Parr from near and far. Children continue to embrace his signature colorful style and positive outlook and it’s easy to see why. If you love yourself then you can easily share that love with friends, family, those in need. And let’s not forget our planet and everything on it. The repetition of “Love Yourself. 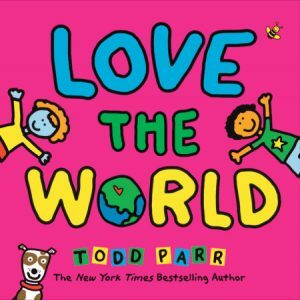 Love the World!” throughout the book serves to reinforce Parr’s inspiring central idea that we’re all worth the effort. “Everything and everyone deserves love,” says the copy on the back jacket cover and it’s so true, only it doesn’t end when the book closes. Youngsters will feel energized and enthusiastic after hearing the rhythmic words and will be motivated to spread sone love and kindness around. 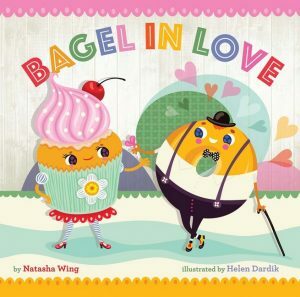 Finding love (and winning a dance contest no one thought he could win) is the sweetest revenge for Bagel who’s got the moves but no dance partner when Bagel in Love first opens. In fact, he can’t get a break. He’s peachy keen on entering the Cherry Jubilee Dance Contest, but it seems Poppy, Pretzel, Croissant, Doughnut and Cake all think he’s not cut out to compete like Fred Éclair. And they let him know it in pun-laden prose good for giggles and grins. 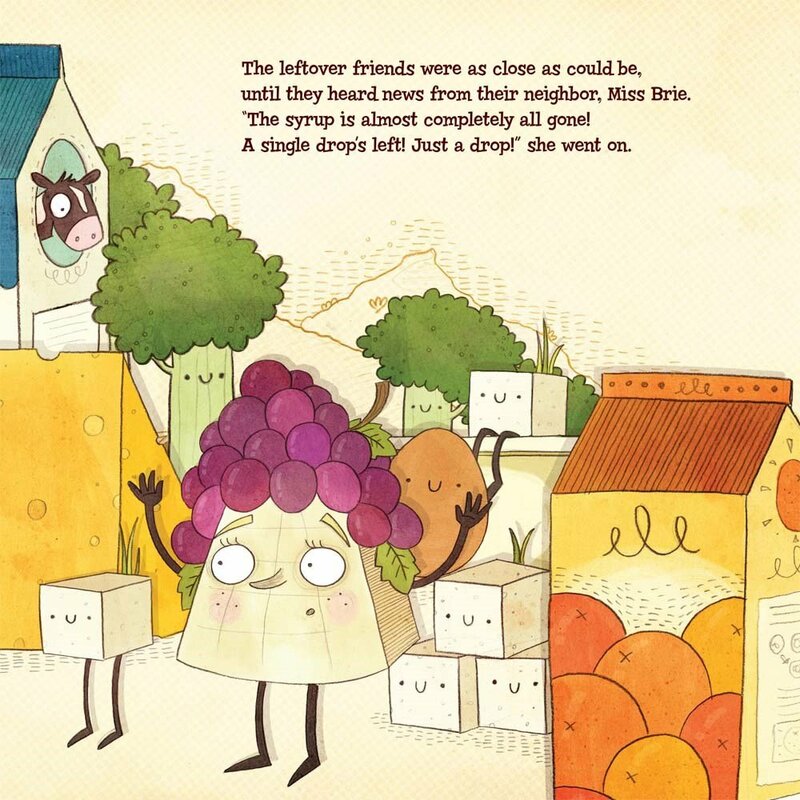 Wing’s wordplay is wonderful as is Dardik’s delightful digital artwork that animates the downer desserts with pinks, purples teals and tons more colors that pop off the page. Some of my favorite lines include, “Matzo flat out told him no,” and “Call me flaky,” said Croissant. “But those moves are totally stale.” When a toe-tapping cupcake comes along and steals bagel’s heart, the two carbs gel, making the best Éclair and Cherryse moves this side of Hollywood. A sparkly cover and final spread are “just icing on the cake” for kids who love a story with a happy ending. 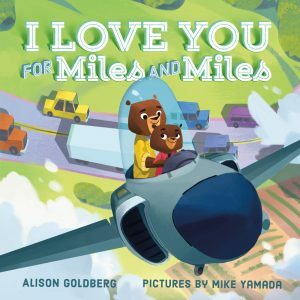 As I read Goldberg’s debut picture book, I Love You for Miles and Miles, I kept thinking how much my children would have enjoyed this story when they were little. They could not get enough of truck, train, excavator and emergency vehicle books and this one fits that bill in every way with a bonus of love tied to each one depicted. The super cool mama bear, talking to her child, conveys the extent of her love with comparisons to big rigs “Stretching side to side, Hauling loads of every shape and size.” And it doesn’t stop there! Her love is faster than a fire truck and higher than the highest plane. No matter where these various tough, strong and resilient modes of transport go, this mama bear’s love goes there too. Yamada’s illustrations are cheerful and bright, always bringing the focus onto the mother and her child. This book is ideal for bedtime reading and, while bursting with love, is not just for Valentine’s Day but all year long. than with a great selection of back-to-school books to read as they settle into a new routine? Underwood sure knows how to make parents and children laugh out loud. Here Comes Teacher Cat is full of sight gags that never fail to surprise and delight. So as not to spoil it for you, I’ll just say that once again Cat has outdone himself in cattitude. 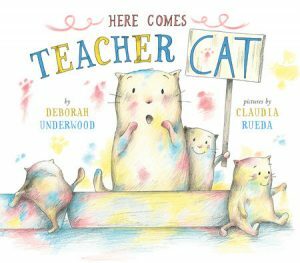 Whether you love the narrator having a one-sided dialogue with a cat who uses signs to communicate, or the laziness of this feline forever yearning to nap, Underwood’s got it all here when Cat is called in to substitute for Ms. Melba at Kitty School. The only problem is that Cat hasn’t a clue what to do first. When he approaches teaching with his own Cat brand of humor and zeal, there’s no holding him or the kitties back causing quite a bit of chaos in the classroom. What will Ms. Melba find upon her return from the doctor? Why, a very clean classroom, a confident Cat and happy kitties of course. Just don’t open the closet Ms. Melba! Fans of Underwood’s humor and Rueda’s low-key spot on artwork will not be disappointed in this Publishers Weekly starred picture book. 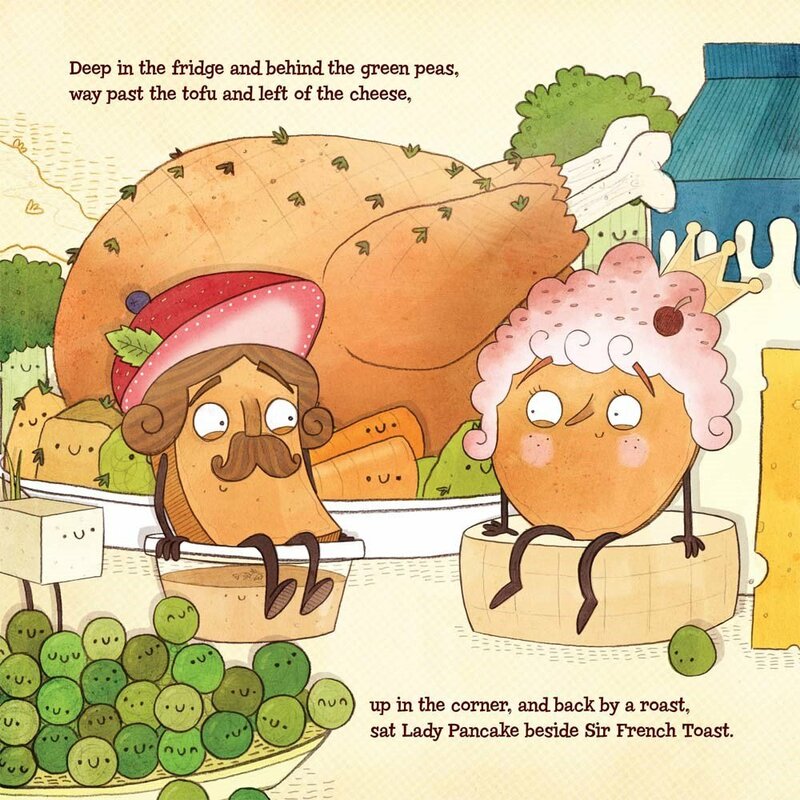 Oh and don’t miss the opening illustrations before the title page. Starting Kindergarten can be scary for most kids, but what happens if you’re a twin? 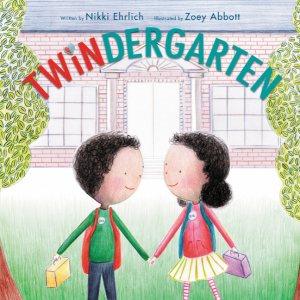 In Twindergarten, author Ehrlich, a mom of twins, tackles the topic gently and thoughtfully, touching on the many issues twins might experience being separated at school for the first time. Though Zoe and Dax are as close as peanut butter and jelly at home, they wonder how they’ll cope being in different classes during the day. They soon learn that Kindergarten is not only fun, it’s a place where they can make new friends, try new things and still see each other during recess. In other words, it’s the best of both worlds. Debut illustrator Abbott puts the emphasis on the main characters clothed in darker outfits in her illustrations making it easy to zoom in how Zoe and Dax are interacting with their environment. Not only for twins, Twindergarten shows the rewards of attending school and how children can be separated from siblings or friends and still thrive. 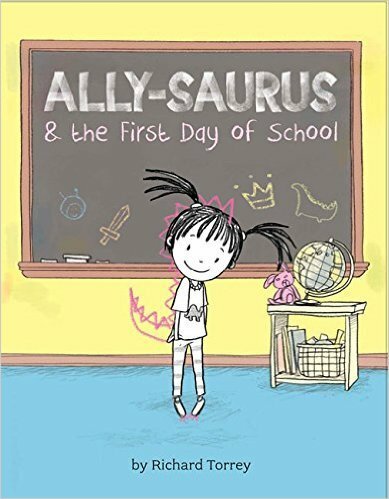 How enjoyable it was to read this clever spin on a back-to-school book. In Don’t Go to School, it’s young Benno who’s excited to leave while his mom wants him to remain at home. “Don’t go to school!” she wailed. And I laughed! The humor was not lost on me since I could relate to the mother in this lovingly illustrated picture book. I think there are lots of parents, like me, who have experienced separation anxiety when sending their child off on the new adventure and life stage that is attending school. Mommy is encouraged by Benno using language much like a parent would to reassure their new student. “Don’t worry, Mommy,” said Benno. “You’ll get to know the other parents in no time. They seem really nice!” Zepf is clearly familiar with first day jitters and her tantrum scene may ring a bell with others, only this time it’s Mommy who’s lost it. My favorite part of the story is when Benno takes some of his own kisses and tucks them in his mother’s pocket so she can feel his love even when they’re apart. 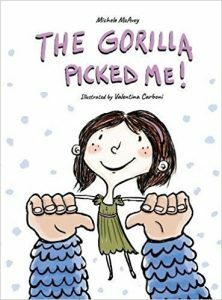 This comforting story will empower youngsters while also providing tips on adjusting to the big change in their lives. 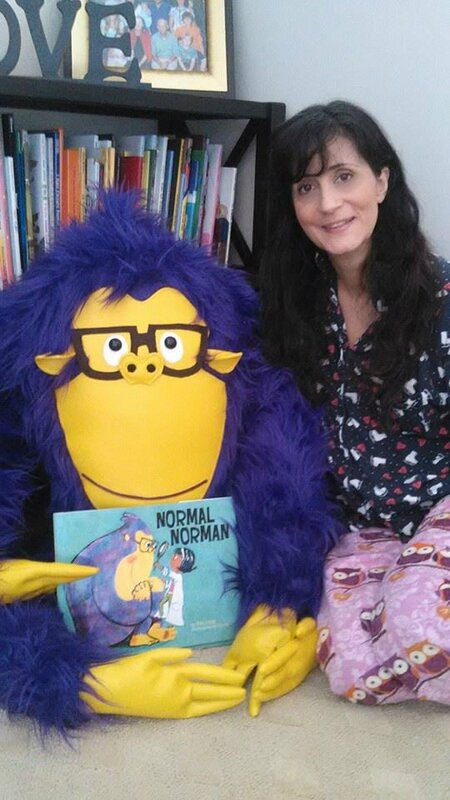 Looking for a great book for a young child in your life? Still have that hard to buy for niece, nephew or grandchild on your list? No worries! 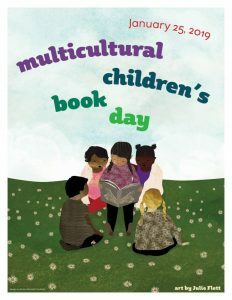 As a children’s bookseller I am fortunate enough to have the opportunity to see a lot of children’s books all year long. 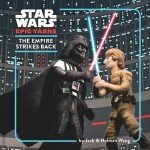 So, I’ve put together a list of some of my favorite board books from the 2015 publishing year to help you with your last minute shopping. With the new Star Wars movie coming out soon what better way to indoctrinate or err…teach a new generation. Each soft, needle felted scene is a recreation appropriate for learning first words. Princess Leia teaches the word “princess,” Luke Skywalker is our example of the word “learn,” and so on. Each scene is so lovingly recreated that every page is of the utmost quality. 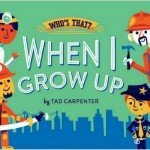 This gem of a board book takes toddlers through several occupations from firefighter to teacher that they might aspire to in the future in a lift-the-flap format. By listening closely to the text, your little one may be able to guess the job of the person behind the flap. 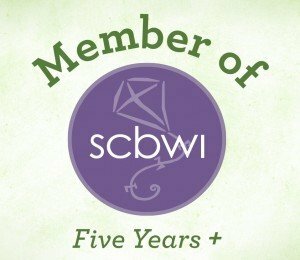 These are all people in your community as well, so it’s a nice roundup of all the people who help us! 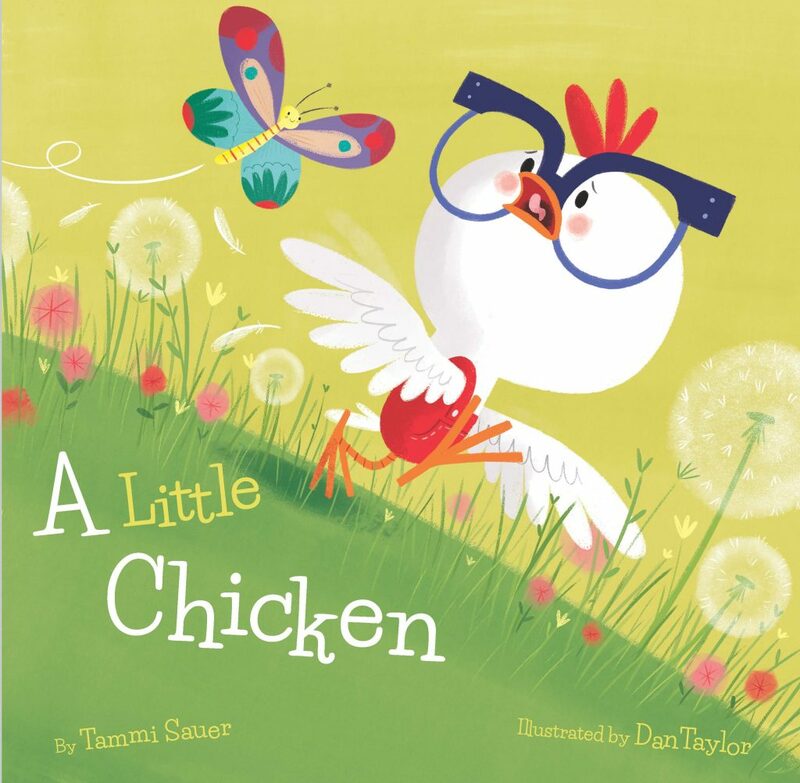 This is an adorable book! 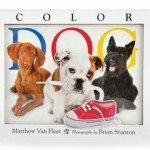 Perfect for a one-year-old or early two this lift-the-flap, tactile book uses pictures of pups to teach colors. Pull out tabs through out the book make the dogs move (even the dog on the cover pulls on the shoe string in his mouth if you pull the red tab). Rhyming text, and a chunky, durable cover make this a great gift. The ultimate battle! Two boys meet. One has a shark toy and the other has a toy train. A hilarious imaginative battle ensues Of course if the battle is underwater then Shark is going to win, but if it’s on land then Train is going to have the upper hand! What about a visit to a library? Right, neither of them would win that one! 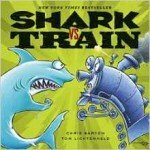 Witty, funny, and it combines sharks and trains in one book. That’s a sure winner right there. 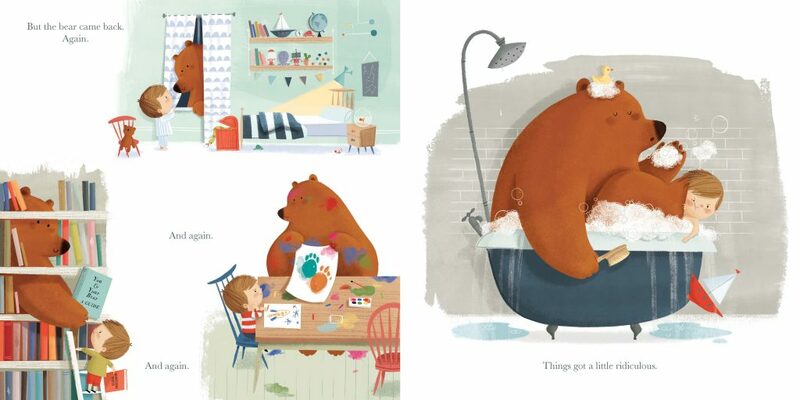 Yumi Heo writes and illustrates such wonderful books! Red Light, Green Light is no exception. This board book has been one of my favorites to recommend this year because it’s both interesting and straightforward. Lift-the-flap elements combine with rhyming text about all the signs that youngsters can see on the road in the car while being driven around town. 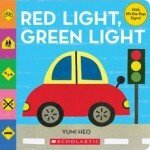 This book is perfect for the little transportation enthusiast in your life, and great for both girls and boys. ELWOOD BIGFOOT: WANTED BIRDIE FRIENDS! In Elwood Bigfoot: Wanted Birdie Friends! all Elwood Bigfoot wants is a friend – preferably a feathered, flittery bird friend! But his earnestly clumsy bigfoot-y manner gets in his way time after time. How can a lonely, large, LOUD Bigfoot get close to his avian amigos-to-be? Elwood tries the direct approach first, chasing after swooping birds and hollering for the birdies to come back. Alas, they only fly away. His next idea is to live in a tree, where he can be closer to the birds. His dedicated handiwork produces a lovely, log cabin style tree house perched against the mountainside. Surely his new neighbors, the birds, will welcome him. Reprinted with permission from Elwood Bigfoot © 2015 by Jill Esbaum, Sterling Children’s Books, an imprint of Sterling Publishing Co., Inc. Illustrations by Nate Wragg. Alas, the birds seem shy. So Elwood tries to disguise himself, dressing like a bird from head to toe with feathers, beak and feet. Experiencing a modicum of success, Elwood thinks he’s finally about to break the barriers to feathered friendship. He shouts for joy! Alas (once again!) the birdies fly away. Esbaum’s charming, lyrical text is delightful to read aloud and incorporates intriguing, playful vocabulary. 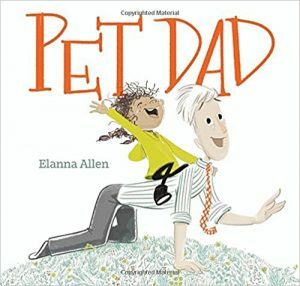 She perfectly captures Elwood’s sense of loneliness in ways that a child can easily connect to, and she conveys his upbeat, hopeful and innovative spirit in appealing ways. While readers see that making friends is not always easy, learning to take the perspective of others is an essential part of the process. Wragg’s illustrations turn Elwood into a marvelous, huggable furball. With a jaunty fedora and sarfari-style binoculars, Elwood is well-equipped for his bird-watching exploits. A single triangular fang and four-fingered, three toed shagginess add to Elwood’s monstrous appeal. Wragg also turns out an impressive flock of feathered friends throughout the pages, and displays them prominently on the book’s endpages. Whimsical and colorful, the birds’ tiny round eyes and pointy beaks reveal an impressive range of tender and comical emotions. 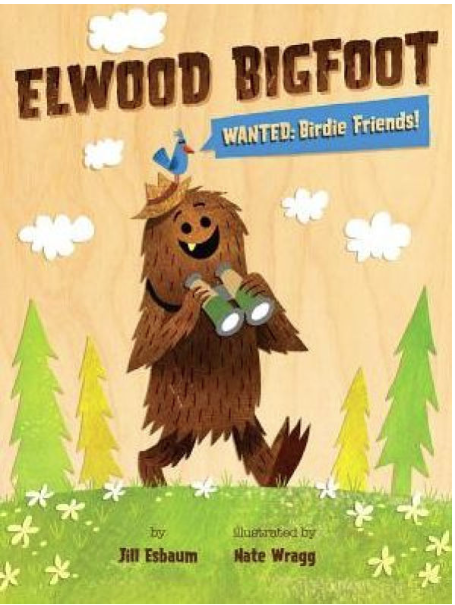 Elwood Bigfoot : Wanted Birdie Friends! is a sweet tale of patience, persistence and friendship. Young readers may look hard at the birds in the yards and trees around them, wondering if they are among Elwood’s best buddies. Don’t miss this encouraging story about dreams that do come true. A downloadable activity kit is available here. 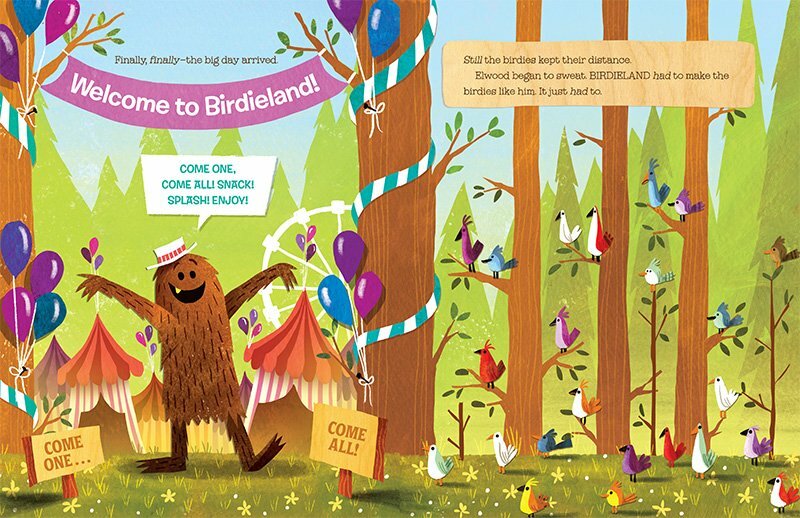 Where Obtained: I reviewed a copy of Elwood Bigfoot: Wanted Birdie Friends! from the publisher and received no other compensation. The opinions expressed here are my own. 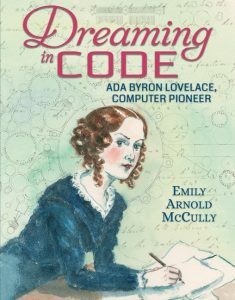 Plus, enter our giveaway to win a hardcopy of the book! We know it’s cheaper by the dozen, but in the case of A Dozen Cousins, it’s also A LOT more fun! “Anna had a dozen cousins. All of them were boys. Imagine being the only girl with 12 rowdy male cousins. What would your days be like when they came for a visit? Anna’s were anything but quiet. 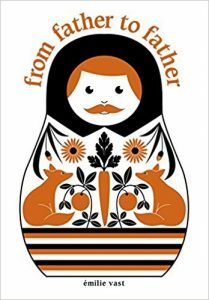 This joyful ode to rough and tumbling, playful and stumbling boys and their only female cousin is pure delight. The rhyme, with its sing song rhythm really never misses a beat. Told with love and laughs, Houran’s picture book draws from her youthful experience growing up with over a dozen cousins. So she knows first hand what types of antics this many kids can get up. Then launched a sneak attack. The entire time that Anna and her possessions (including her doll!) are used as objects of entertainment for the lads, she never once arches her eyebrows in anger! 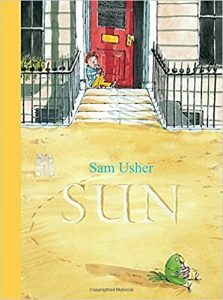 Usher’s whimsical illustrations, a cheerful and welcome blend of Quentin Blake meets Helen Oxenbury, depict an understated calmness in Anna, with all her reactions demonstrating a deep affection for her mischief-making young relatives. Ultimately, despite all her cousins’ shenanigans, Anna wouldn’t change a thing about their behavior and is thrilled to be a part of this extended and extremely fun-loving family. An adorable book about a bunch of boys you’ll wish were your cousins. Don’t miss checking out the end papers for a sweet surprise! Twelve Dancing Unicorns, by Alissa Heyman with illustrations by Justin Gerard, (Sterling Children’s Books 2014, $14.95, Ages 4-7). Cover of Twelve Dancing Unicorns. Reprinted with permission from Twelve Dancing Unicorns © 2014 by Alissa Heyman, Sterling Children’s Books, an imprint of Sterling Publishing Co., Inc. Illustrations by Justin Gerard. Those of you familiar with The Twelve Dancing Princesses by the brothers Grimm, will enjoy this enchanting adaptation of the popular fairy tale. For those of you who haven’t read Grimm’s fairy tales, Twelve Dancing Unicorns, a stunning new picture book, easily stands on its own. Despite being guarded by his finest men, the king finds his twelve prized unicorns mysteriously break free of their golden chains each night unseen by the watchmen. People come from all over the land to see the unicorns, but one young girl has grown particularly fond of the smallest one. She sees the creatures are unhappy being cooped up, and wants to help them. When the king offers to grant a wish to anyone who can solve the mystery of the broken chains, the girl is the first to step up. Laughed at by the townspeople, and chided by the king for being too young to handle such a task, the girl remains undaunted. With the help of her mother, who gives her an invisibility cloak, and the bright moonlit sky, the girl discovers the unicorns’ secret, and has quite an adventure in the process. Interior Artwork Reprinted with permission from Twelve Dancing Unicorns © 2014 by Alissa Heyman, Sterling Children’s Books, an imprint of Sterling Publishing Co., Inc. Illustrations by Justin Gerard. I was reminded of Jan Brett’s illustrations, as I got lost in Gerard’s ability to capture otherworldly beauty in his work. His use of page and picture boarders provides a classic fairy tale feel to a modern book. I found Heyman’s lyrical story book style of writing very appealing; her words capturing the wonder and glory of the mystical world of unicorns. Twelve Dancing Unicorns: a must read, must keep, and must pass down from generation to generation picture book. Follow the Twelve Dancing Unicorns blog tour tomorrow on ‘lil Burghers by clicking here.